The Wall Street Journal recently reported: “Both of the leading Democratic presidential candidates made the case [during the last debate] that the financial services industry wants to keep them out of the White House, fearing the tough regulatory measures they would impose if elected.” Vox reports: “According to [Bernie] Sanders, a bank that is too big to fail is too big to exist … Sanders has gone beyond offering dream legislation to suggest that if he is elected president he will achieve a bank breakup within one year, whether Congress likes it or not.” And Lee Fang of The Intercept reports January 23: “After Hillary Clinton spoke at a town hall in Manchester, New Hampshire, on Friday, I asked her if she would release the transcripts of her paid speeches to Goldman Sachs. 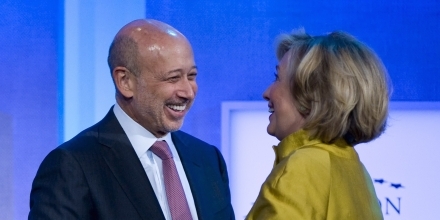 She laughed and turned away.” See video and RootsAction DIY alert urging release of Clinton’s speeches to Goldman Sachs. She said today: “The hazards posed to the economy and our savings by risky Wall Street banks have become a major campaign issue in the presidential debates. Some say the problem can be solved with more regulation. But we already tried that with Dodd-Frank, currently the most complicated bill ever passed by Congress — and it hasn’t solved the problem. Dodd-Frank replaces bailouts with ‘bail-ins’ — depositors will be at least partly liable for keeping too-big-to-fail banks afloat. And the massive tangle of new regulations has hamstrung smaller community banks that loan to small businesses, creating jobs. What will replace the banks if we break them up? Publicly-owned depository banks modeled after the Bank of North Dakota can serve that purpose, and partner with community banks to direct credit where it’s needed locally, reduce the costs of government, and eliminate outlandish Wall Street fees and the need for derivatives to mitigate risk.” The Public Banking Institute notes that in addition to recent moves in New Mexico, the Philadelphia City Council passed a resolution last week authorizing hearings on public banking.